Ignacio Fernandez Lobbe has enjoyed an outstanding international career spanning a decade in which he has won 66 caps following his debut, against the United States, in 1996. He is the older bother of Juan Martin, the international flanker. Lobbe senior has represented Argentina at three Rugby World Cup finals and was a central figure in the success at the 2007 tournament when the Pumas finished third overall. He did have thoughts of retirement following the 2007 World Cup in France but decided to continue his first-class career by joining Northampton for a further stint. 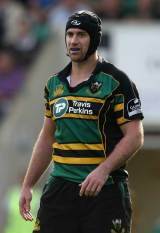 Lobbe has gained popularity at both Sale and Northampton. Supporters nicknamed him 'Nacho' and have delighted in his non-stop work rate. He joined Sale after playing in France for Castres and Bordeaux and besides playing a crucial part in the success of Argentina, Lobbe has also played a big part in the success at Sale in the squad put together by Philippe Saint-Andre, the former French international. Lobbe was among the players recruited by the former French international and the squad went on to win the European Challenge Cup (2005) followed by the Guinness Premiership (2006).